Colt Brennan was escorted off the field after being knocked out with 10:43 left on a hit by Fresno State linebacker Marcus Riley with 10:43 left in the game. Brennan was initially diagnosed with a grade-three concussion which was later upgraded to a mild concussion. Brennan said he expect to play Friday. The late show got off to a fast start last night at Aloha Stadium. It ended with another win for Hawaii, but also concern for the Warriors' star quarterback, Colt Brennan. Brennan was knocked out of last night's 37-30 victory over Fresno State with what was initially diagnosed as a grade 3 concussion. The concussion was downgraded after the game to mild and Brennan said in a statement that he intends to play Friday at Nevada. The nation's most productive offense scored on its first five possessions, and 14th-ranked Hawaii (9-0, 6-0 WAC) made its opening statement in its four-week quest for national respect and a BCS bid. The win over Fresno State (6-4, 5-2) might not be the most compelling evidence, as the UH offense fizzled in the second half, but it's a victory against a team with a winning record. And it was on national TV -- albeit starting at 11 p.m. back east, long after No. 1 Ohio State lost to Illinois, leaving UH and Kansas the only unbeaten teams in the country. A near-sellout crowd of 49,047 saw the Warriors jump to an early 21-0 lead with a solid team rushing effort of 138 yards. Brennan passed for two touchdowns, one each to Jason Rivers and Davone Bess, tying Ty Detmer's NCAA record of 121 career scoring passes. But a scrambling Brennan was belted by Fresno State linebacker Marcus Riley with 10:43 left in the game and knocked unconscious. After about 5 minutes, a shaken Brennan slowly walked off the field. Tyler Graunke replaced him. A video review showed that Riley led with his shoulder, a legal hit. No penalty was called. The national perspective is that things have come easy for Hawaii this fall, as the Warriors devoured cupcakes throughout September and October. They rolled up win after win against teams with losing records -- and a couple of the games went to overtime, which is good for team building but not impressing pollsters. When not beating up on their weak opponents, they were cruising through a couple of bye weeks to recover from the epic struggles against the San Jose States and New Mexico States of the world. But that image may change as more people see replays of the hit that knocked Warriors quarterback Colt Brennan out of last night's 37-30 victory over Fresno State. The Warriors are now 9-0 and 6-0 in the Western Athletic Conference, one of just two unbeaten teams left in the nation. But much of the talk was about Brennan's status after the hardest hit many watching had ever seen in a football game. The crushing blow (shoulder first, no flag) dealt by Bulldogs linebacker Marcus Riley left Brennan unconscious briefly, and with what was initially diagnosed as a grade 3 (the most severe) concussion. 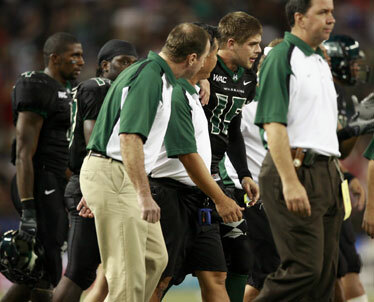 It was later described as "mild" by a UH official, and several people said Brennan was back to normal after the game. Brennan did not talk to reporters afterward, but did release a statement. "I'm doing fine," he said through a UH spokesman. "I'd like to thank everyone for the support they gave out there. I'm looking forward to getting back on the field for next week's game against Nevada." Receiver Ryan Grice-Mullins said it was hard to finish the game thinking about what had happened to his teammate and friend. "I knew as soon as the dude hit him and Colt went down it wasn't good," he said. "It's not just (about) football. Anyone seeing a family member go down like that you forget about everything else. I never wish that on anyone, both sides of the ball. I was glad both teams' trainers (assisted), Fresno showed real class. (Brennan) showed real heart getting back on his feet. I hope the island continues to pray for him." His condition was later described as a "mild concussion," and a UH official described Brennan as "day-to-day" when it comes to football duties. Brennan did not require hospitalization. Coach June Jones said he does not expect Brennan to miss Friday's game at Nevada. "He's ready to play another four quarters," said a smiling Terry Brennan. Brennan went down with 10 minutes, 43 seconds left in the game and the Warriors leading 37-23. He was down for about 5 minutes. "I've seen a lot of hard hits, but I think he was out before he hit the ground," Jones said. Fresno State coach Pat Hill spoke to the Warriors after the game, and was generous in his praise of UH. "I'm very competitive, but I'm real proud of what Hawaii's doing and Boise's doing," Hill said. "I think they're doing a great job in our conference. We're just a little bit young." Hill was also proud of his own team. "Most teams would've folded down 24-7 in the first quarter," he said. "We don't go anyplace to lose." 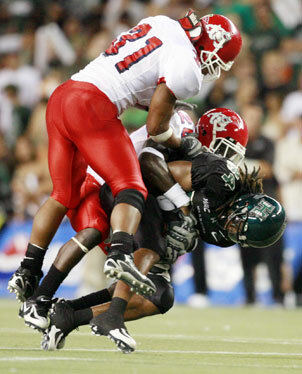 The Warriors' Jason Rivers hung onto the ball despite being sandwiched by Fresno State's Marcus Riley and Lorne Bell. The way the game started out, it appeared the Warriors would cruise to a big win. UH scored on its first five possessions, and Brennan passed for two scores, matching Ty Detmer for the all-time NCAA career touchdown record of 121. Brennan found Jason Rivers wide open behind the Fresno defense on the third play from scrimmage. Rivers caught the ball in stride at the Bulldogs 25 and sprinted the rest of the way to the end zone. Rivers continued the nation's longest ongoing streak of games with at least one reception. It is now at 46. Grice-Mullins caught nine passes for 128 yards and is over 1,000 yards for the second time in three years. And the Warriors running backs had their best game of the season, accounting for 144 of UH's 547 yards of total offense. Leon Wright-Jackson -- who led Hawaii with 65 yards on six carries -- went 33 yards on a draw play midway through the quarter, and it was 14-0. Daniel Libre carried six times for 61 yards in his debut as a Warriors running back. "I knew the last four games we will have to run the football," Jones said. "And I knew they could pass rush. They have good pass rushers. Daniel had a little something about him. I'm happy with him and Leon and David (Farmer)." Brennan kept for a 3-yard TD run, bumping the lead up to 21-0 with 5:14 left in the first. The UH defense held the Bulldogs to 12 yards rushing and 52 overall in the first quarter and 147 yards in the first half. A.J. Jefferson got Fresno State on the board at the 5:01 mark with a 98-yard kickoff return -- his second TD on a kickoff runback in two weeks. Dan Kelly's 25-yard field goal at 3:27 of the first made it 24-7. Brennan's 5-yard pass to Davone Bess tied Detmer's record and put the Warriors ahead 31-7 at 11:26 of the second quarter. Bess, who caught nine passes for 98 yards, now holds the Hawaii career record for touchdowns by himself with 39. The Bulldogs mounted their first sustained drive of the game midway through the second quarter, but settled for Clint Stitser's 28-yard field goal. But Fresno State's offense finally found the end zone with 41 seconds left in the first half. The Bulldogs took advantage of a Brennan fumble recovered by Mike Cheese at the UH 21. FSU then ran the ball five plays in a row, but then Tom Brandstater lofted a 6-yard touchdown pass to tight end Isaac Kinter. Stitser missed the extra-point try. Brennan then completed four passes in a row to drive UH from its own 14 to the Fresno State 33 in 39 seconds.Kelly kicked a 50-yard field goal to end the half. After a scoreless third quarter, Kelly kicked a 24-yard field goal with 14:16 to go in the game. Myron Newberry recovered a fumble caused by Adam Leonard early in the third, when the Bulldogs drove to the Warriors 29 on the first series of the half. Fresno State closed to 37-23 with a six-play, 85-yard drive capped by Brandstater's 31-yard TD pass to Marlon Moore with 11:49 left in the game. After Brennan's injury, the Bulldogs rallied with another Brandstater-to-Moore touchdown with 1:31 left. Officials -- Referee: Bill Athan Umpire: Mike Rhoades; Linesman: Robin Hall; Line judge: Walter Coleman; Back judge: Jim Settle; Field judge: Jay Taylor; Side judge: Vern Sparling; Scorer: Dara Young. Rushing -- Fresno St.: Clifton Smith 17-105, Lonyae Miller 17-78, Will Harding 2-13,Marlon Moore 2-6, Tim Lang 1-3, Brandstater 5-(-17). Hawaii: Wright-Jackson 6-65, Daniel Libre 6-61, David Farmer 1-14, Colt Brennan 6-5, Tyler Graunke 3-(-4). Passing -- Fresno St: Brandstater 15-26-0-209. Hawaii: Brennan 28-39-1-396, Graunke 1-1-0-14. Receiving -- Fresno St: Seyl Ajitotutu 4-64, Moore 3-59, Smith 3-35, Isaac Kinter 2-13, Lang 1-19, Bear Pascoe 1-12, Jason Crawley 1-7. Hawaii: Ryan Grice-Mullins 9-128, Bess 9-98, Rivers 3-86, Wright-Jackson 3-33, Farmer 2-29, Malcom Lane 2-17, C.J. Hawthorne 1-19. Tackles for loss-yards -- FSU: Riley 1-1, Cheese 2-7, Monga 2-6. Hawaii: Kalilimoku 2.5-16, Mouton 2-10, Purcell 0.5-1, Soares 1-7. Sacks-Yards -- FSU: Cheese 2-7, Monga 1-5. Hawaii: Kalilimoku 2.5-16, Mouton 1-4, Purcell 0.5-1, Soares 1-7. Interceptions -- FSU: Cheese 1-0. Hawaii: None. Kicks blocked -- FSU: None. Hawaii: None. Quarterback hurries -- FSU: Tolbert. Hawaii:Kalilimoku, Veikune, Fonoti.